Take the helm on board your own self drive motor boat! Book a morning Red Boat hire in advance or a weekday afternoon hire. Why not try your hand at skippering your own boat by hiring one of the fleet of Self-Drive Red Boats?! They are fantastic fun, safe and easy to drive. Enjoy a leisurely maximum -hour hire, exploring York from the helm of your own self-drive motorboat. 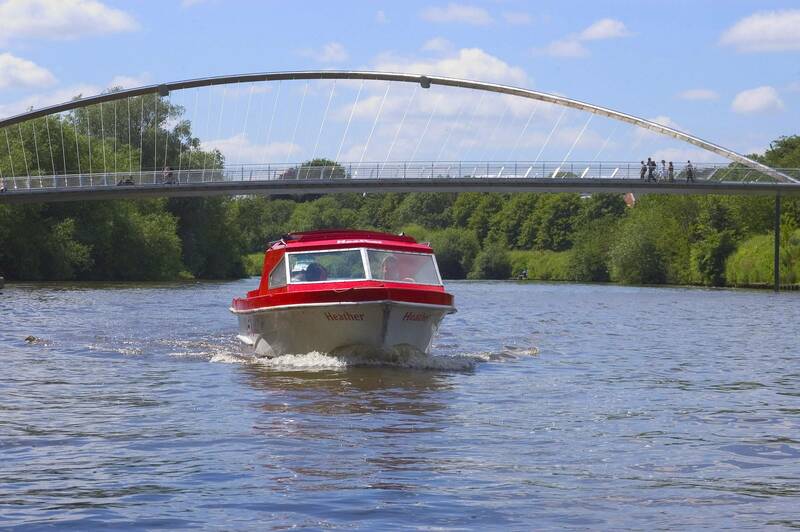 Become a captain and explore the sites of York’s riverside in style! The boats can accommodate up to 8 people and so provide plenty of room for you all to head out on your own aquatic adventure, exploring the same river that brought the Vikings to the beautiful city. You will receive full instructions on how to operate your motor boat along with the safety and river rules, whilst life jackets will be provided for any children. Boats leave every 30 minutes from 10:00 AM but self-drive boats are for 1 hour - please make mention of your desired time in the comments box. When booking, you are required to arrive at the Red Boat Hire Point 15 minutes before the time of hire to allow time for the rules of the river, area of operation and boat handling instructions to be explained. Should you arrive late then you will lose your booking. A minimum, returnable cash security bond of £40 is required for all hires. The security deposits must be paid in full cash by cash upon arrival at the landing. Red Boat operating area, so with a one hour hire you will be able to take in the whole city from the river. We or agents reserve the right to refuse to hire a Red Boat to anyone deemed likely to breach the terms of hire. All male or all female parties may be refused hire. Red Boats are available to hire from 9:45 AM on the above dates. The earliest closing is 3:00 pm under normal circumstances, although this may be earlier when determined by factors such as bad weather or rising river levels.